These are a gem of a dish, either as a starter at a dinner party or a full meal, combined maybe with a salad or some yummy veggie side. They are not difficult, just a little time consuming. For the veggie bacon bits, I like the Tivall ones from AH in the Netherlands. It can be made vegan by replacing the veggie bacon bits with tofu, and the cheese with vegan cheese. Enjoy wowing your guests with this one - it's worked for me! Carefully remove the stalks from the mushrooms and chop finely. Warm one tablespoon of oil in a large frying pan, and lightly fry the bottoms of the mushrooms on medium to low heat, pressing on the top of the musroom caps with a fish slice to flatten slightly and ensure the whole base of the mushroom is pre-cooked. Meanwhile, in a heavy based saucepan, heat the rest of the oil on medium heat. Add the chopped mushroom stalks, leek, celery, veg. bacon bits/tofu, courgette and carrot and cook for 5 minutes, stirring regularly. 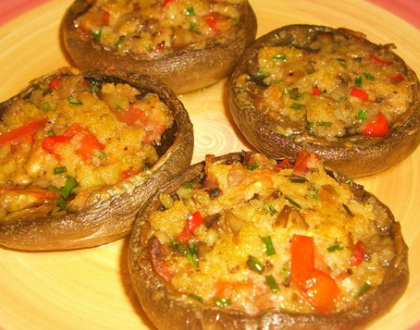 Remove the mushrooms from the frying pan when they are lightly browned on the bottom - after 5-10 minutes. Add the pine nuts and lightly toast them for 2-3 minutes, watching carefully to make sure they don't burn. Stir the breadcrumbs, basil, tomato paste into the vegetable mix. When the pine nuts are ready stir these also into the vegetable mix and season with salt and pepper to your own personal taste. Put the mushoom caps into a casserole dish and divide the stuffing evenly between the caps until they are reasonable heaped. Pour the vegetable stock into the dish around the mushrooms, but not directly onto the mushrooms. Then sprinkle with grated cheese. If you have some left you can put this in a separate casserole dish and sprinkle with cheese and bake, or alternatively combine with pasta and cheese, for a tasty snack. Put the mushrooms into the pre-heated oven for 20 minutes, or until the mushrooms are cooked through the cheese has melted.